Ag mega-mergers threaten to undermine the basis of our food supply and jeopardize efforts to build climate resilience. Allowing more farm inputs to fall into fewer hands is a recipe for disaster. Nationally and internationally, governments must strengthen their anticombines/ cartel regulations to break up agricultural input sectors so that pesticide companies can’t also be seed companies and farm machinery companies can’t control chemicals, seeds, crop insurance, etc. Secondly, governments need to take a hard look at corporate “innovation,” recognizing that today’s intellectual property system smothers useful innovation and retards progress. To move us all toward food sovereignty, the world needs a new configuration of true innovators, including smallholder producers and public researchers – who are not undermined by spineless regulators. 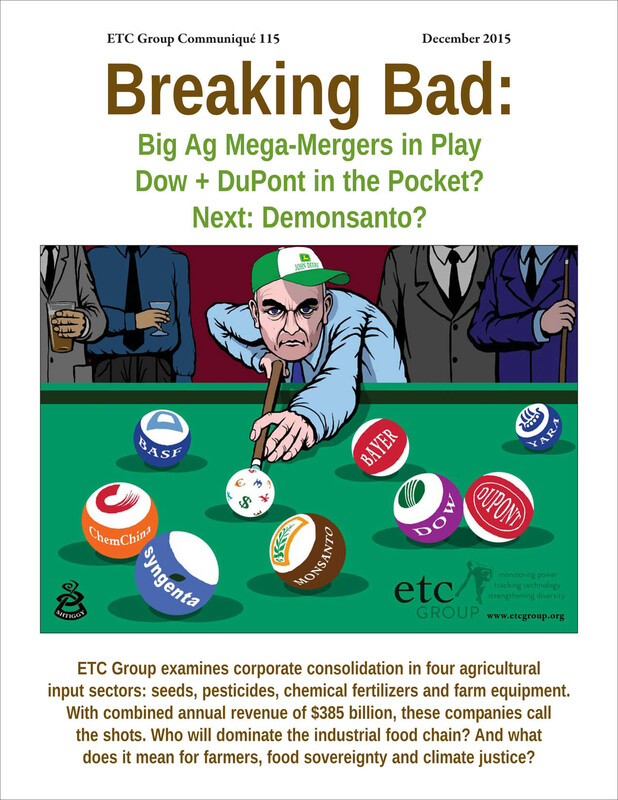 The international battleground is wherever the Big Six – and their Bigger Brothers in farm equipment and fertilizers – push for even greater market power under the guise of “Climate-Smart Agriculture” while evading antitrust constraints and regulatory scrutiny for new, high-risk technologies (e.g., synthetic biology). Beyond the urgent need to suspend (better yet, end) exclusive intellectual property monopolies, the most important battleground is in the global South, the prime growth region for industrial agribusiness. There is no benefit for farmers or consumers if Argentina, Brazil, South Africa, China or Indonesia, for example, accept foreign corporate control over the first links in their food security chain. If two or three of these countries “just say no,” the mergers won’t happen and everybody’s game plan changes.